Many of us are familiar with the terms "slipped disc" and "herniated disc." But few people outside the medical profession truly understand how critical their spinal discs are. 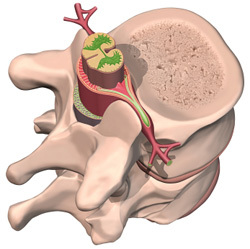 Without discs, our vertebrae would grind against each other and our spines would collapse under the strain. Disc disorders are generally classified as contained discs or noncontained discs. Contained discs are discs that are essentially intact, but protruding where they do not belong. Noncontained discs are ruptured discs that also may protrude into another area of the spine, leaking their fluid and causing havoc.